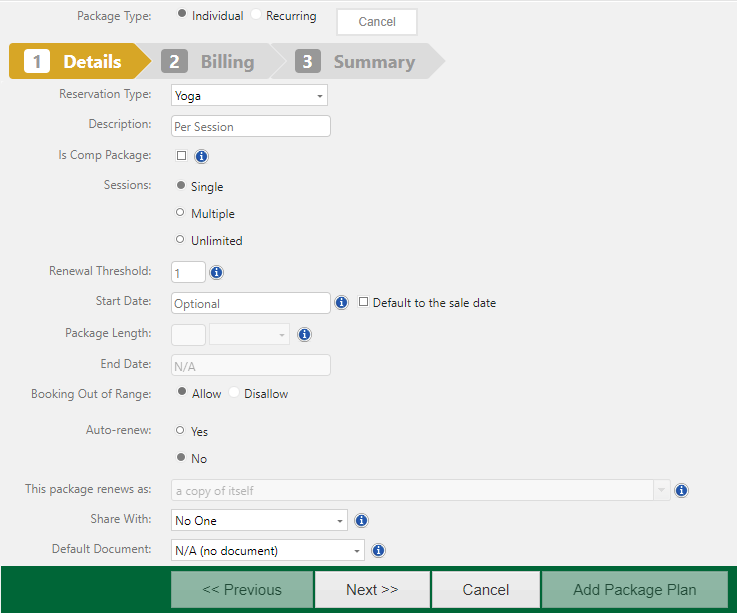 This lesson will show you how to create a single session package plan. **Trainer Tip: Use the left navigation sidebar for quick access to the Packages settings. Locate the Packages section and select Package Plans. Select +Add New Package Plan. Select Individual as your Package Type. 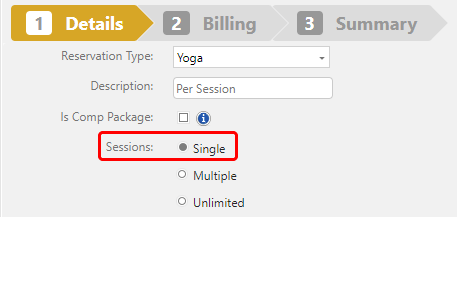 In Step 1 of the creation of the single session package plan, you will be adding the important Details to create it. In the Reservation Type drop-down menu, you will select the desired reservation type. If you have not already set up your reservation types, see How to Set Up Reservation Types. Add a Description of the package. In the Sessions option select Single. 4. Click on Next to create the Billing for the package. 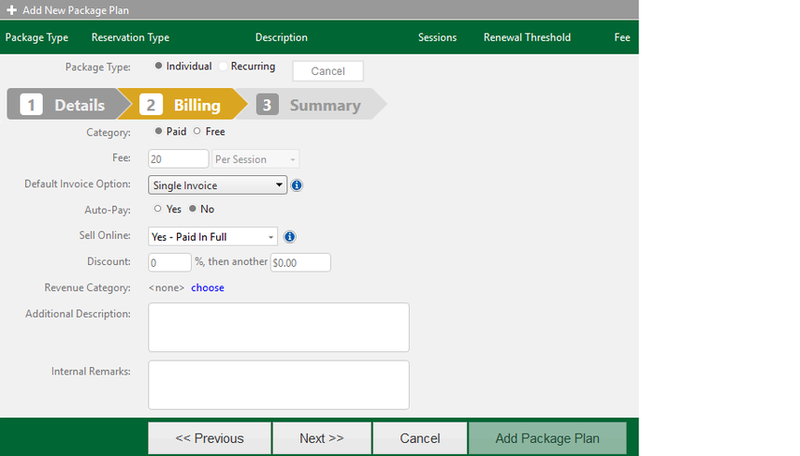 In Step 2 of the creation of the package plan, you will be adding the Billing for it. The Category option allows you to categorize a package as Paid or Free. In the Fee field, you will put in a monetary value for the package and you will have an option to bill it Per Session or Per Package. 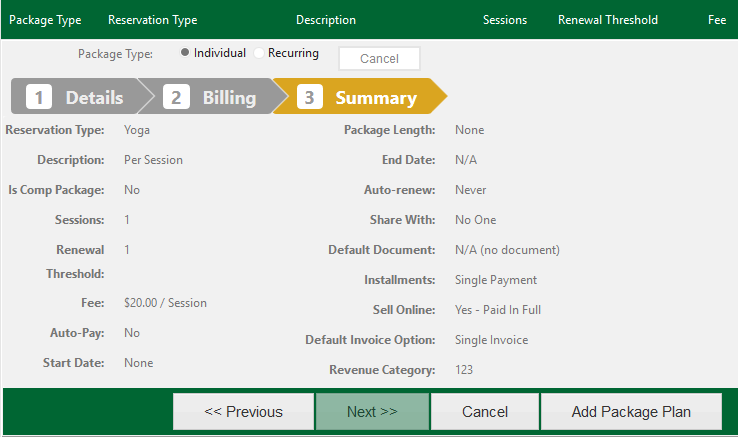 For the Default Invoice Option, you will have the option to select No Default, Single Invoice or Leaves items in cart for when the package is sold. You can choose to have this option default to "Yes" or "No" for Auto-Pay on the billing for the package. Sell Online option is used to determine if a package is going to be sold only via Self-Service. Discount fields allows for a discount to be applied when the package is sold. Revenue Category can be selected to allow for the assigning of a specific revenue stream. Additional Description and Internal Remarks allow for the adding of additional information of that package. Click on Next to view the Summary of the package. **Trainer Tip: If you selected Single Session, the fee setting will be Per Session by default. You will not be able to choose the Per Package option. In Step 3 of the creation of the package plan, you will be reviewing the Summary of the package plan that will be added to your list of available package plans to use. If the information that appears in the Summary section appears correct you will then click on Add Package Plan to have the plan created. The single session package has been created and will appear in your list of available package plans.